Post written by solutions architect Andrea Calvin. Bright eyed and caffeine fueled, the FableVision Extra Life Team assembled at the Boston studio at 8 a.m., on Saturday. An hour later there would be pancakes and games – lots and lots of games. If you haven’t been following our past posts, here’s a quick rundown on Extra Life: Extra Life is a 25-hour gaming fundraiser for a Children’s Miracle Network hospital. FableVision has an amazing partnership with Boston Children's Hospital from our work on Generation Cures with Children's Hospital Trust; we were proud to choose them as our hospital-of-choice for our donations. With a goal of $5K and 17 participants, team FableVision raised $5,675 for Boston Children’s Hospital. Extra Life as a whole brought in over $3.6 million! We're hugely grateful to everyone who donated to our team. Thank you, thank you, thank you. Honestly, there were a few thoughts that it would be impossible to play games for 25 hours straight. But, we did it (with a few naps). Folks cleared out their gaming closet and brought in every board game imaginable. There were games about space, trains, spies, building villages, storytelling... and did we mention space? Then we created multiple gaming stations for the PlayStation, X-Box and Wii. When board and video games got stale, the girls got creative! In one room there was several rounds of a nail polish game. Fancy! On Sunday, after normal folks turned their clocks back for daylight savings, the FableVision Extra Life team marked the second 2 a.m. with more games. 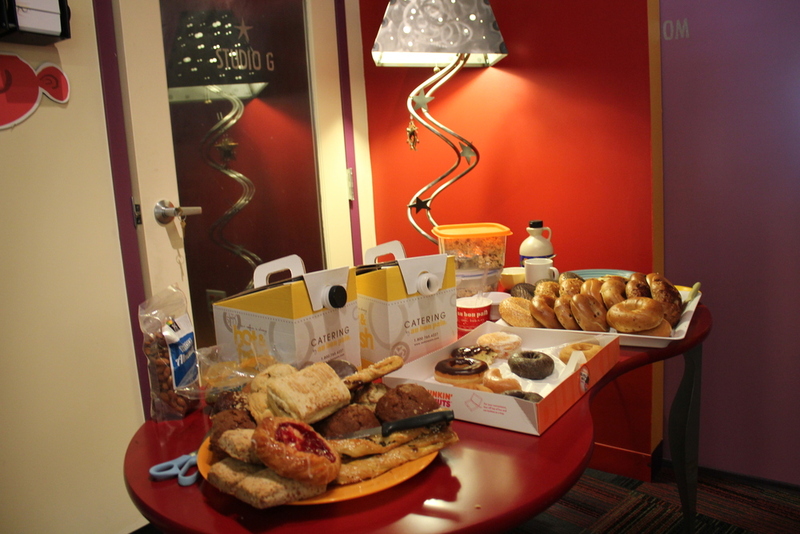 A special thanks to Au Bon Pain, who loaded up the studio with donated bagels, pastries, and boxes of coffee.